If timing is everything, now is the time! The newest chapter in the Burquitlam real estate district transformation is upon us! 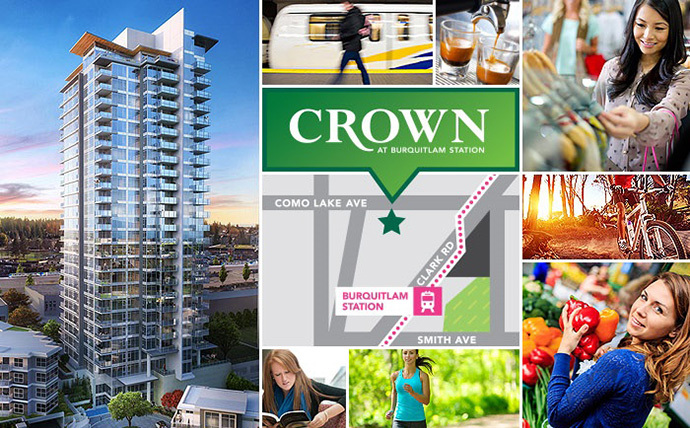 Introducing the West Coquitlam Crown Condos located at Burquitlam Station at the crossroads between Burnaby and Coquitlam in the Lower Mainland! Brought to you by master builder Beedie Living, the new Crown Coquitlam condo tower is located in West Coquitlam just minutes from the future Burquitlam SkyTrain Station along the Evergreen Line. The transit corridor will connect you to all points in the Lower Mainland including out east to Port Moody, west to central Vancouver and the downtown core in addition to south to Surrey and Richmond/YVR. The dedicated residential condo high-rise by Beedie Living will feature contemporary West Coast architecture by Chris Dikeakos Architects. The landmark Coquitlam high-rise tower at the Crown at Burquitlam Station will feature almost 6,000 square feet of private indoor and outdoor amenities too! This Burquitlam neighbourhood is changing rapidly and being the first to call it home has its prime advantage! From the transit corridor to numerous parks and recreational facilities and from a great mix of single family, attached townhomes and multi-family condominium living, the Burquitlam real estate district is primed for long-term growth. The great quality and mix of housing is already highly sought after by all types of home buyers and residents including first time purchasers, downsizers, upsizers, retirees, students and investors alike. More information is online at www.crownliving.ca or you can simply register on this page for more details from accredited agents who can lead you through the home buying process for presales. Presentation centre will be opening at Unit 104 – 552 Clarke Road Coquitlam. All homes come with the 2-5-10 New Home Warranty provided by Travelers Guarantee of Canada. Located in the West Coquitlam Crown at Burquitlam Station condo tower is designed by Chris Dikeakos Architects and will feature modern West Coast designs. The architectural features of this landmark tower include expansive windows, high quality exterior finishes like beautiful glass enclosed balconies, cedar inspired soffits and stone detailing. The Burquitlam high-rise will soar 27 stories into this neighbourhood and will feature breathtaking and unobstructed views out to the North Shore mountains, the Coquitlam community and Burnaby Mountain. The entry lobby is richly designed with outdoor professional landscaping, lighting and a glass entryway with calming water feature custom designed for this project. As well, the new Burquitlam Crown Coquitlam presales condos will feature a grand lobby with double height ceilings, cozy fireplace, custom wood paneling and fully furnished seating area. The on-site amenities include both outdoor and indoor spaces. With over 3500 square feet of indoor amenities, residents can enjoy an entertainment kitchen and dining room for large parties and private functions, a fireside lounge with flat screen television, games room with foosball tables, television and comfortable seating as well as a full fitness centre that’s air conditioned! The gym also includes a yoga studio, free weights and cardio equipment. There is also a fully furnished guest suite with a small kitchen and bathroom for out of town and overnight guests. The presales Burquitlam Crown Coquitlam condos for sale will also feature over 2400 square feet of outdoor amenities that includes a children’s play area and a professionally landscaped courtyard with outdoor terrace lounge, with fireplace, BBQs, dining area and a beautiful water feature. The new West Coquitlam Crown at Burquitlam Station condos will also have a resident live-in care taker. The building entry, parking, elevators and amenity spaces will be highly secured with key fob access. The parkade will be well lit. The spacious floor plans are open concept and very functional. The new Coquitlam Crown condos will provide 2 designer colour schemes that are professionally selected by award winning Bob’s Your Uncle Design group. The bedrooms and living areas have wood grain laminate floors and most living areas will have 8’6” ceiling heights. Penthouses will have double height ceilings as per floor plan. There are grand over height entry doors, expansive windows, generous balconies with unobstructed views as per suite and LE energy efficient full sized front loading washer and dryer with LED display. All master bedrooms will have USB ports too! The beautiful kitchens at the presale West Coquitlam Crown at Burquitlam Station Beedie Living development will offer intuitive layouts, custom shaker style upper and lower cabinetry, elegant quartz counters with marble herring bone backsplashes, soft close cabinets hardware and under cabinet lighting. The premium stainless steel appliance package includes a Panasonic microwave, Bosch dishwasher, Vonmar chimney hood fan, Bosch 5 burner gas cooktop with electric wall oven and a Fisher&Paykel Active Smart Fridge with bottom freezer drawer. There is an in-sink garburator, electrical outlets including a USB port and a polished chrome Grohe kitchen faucet with double bowl stainless steel sink (ten inch deep). The beautiful bathrooms at the new Crown Coquitlam condo tower include a relaxing soaker tub in the main and secondary bathrooms, Grohe shower system in beautiful showers with over height glass doors and honed marble tiled niche with custom shelving. Other bath features include polished chrome faucets by Grohe, under mount sink, shaker style vanity cabinetry and marble or quartz counters. The newest condominium high-rise community by Beedie Living is coming to West Coquitlam and it’s called the Crown Condos at Burquitlam Station. The one, two and three bedroom residences are located just a block away from the future Evergreen SkyTrain station that is already under development. It will take you less than ten minutes to get to SFU as well as the beautiful amenities and outdoor recreation of Burnaby Mountain. 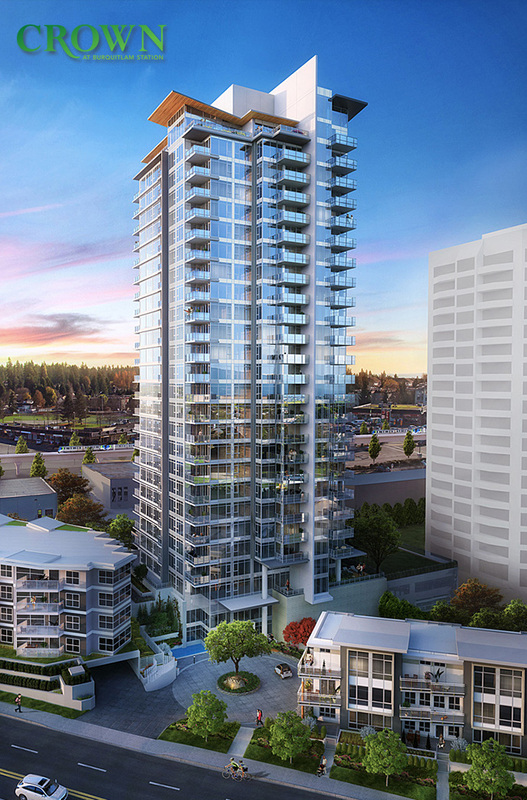 Convenience taken to new levels, the new Burquitlam Station Crown Coquitlam condos will be coming soon. This is an exciting time for Burquitlam real estate district at the crossroads between Burnaby and Coquitlam in the Lower Mainland. A transformation has begun and you can be one of the first to be a part of it. New Neighbourhood. New SkyTrain. New High-Rise. And a new opportunity for you. Beedie Living, the developer of the highly successful condominium residences, The Austin and Station Square, is proud to present the new Coquitlam Crown at Burquitlam Station project. Crown Condos in Coquitlam feature exceptional views, thoughtful design and the most spacious and livable homes. Also offering a rare and in-demand three bedroom floorplan, Crown at Burquitlam Station is the best value in new concrete condominium homes in Coquitlam. Within this ideally situated neighbourhood, you will find Simon Fraser University, restaurants, recreation, everyday conveniences and in the not too distant future, a new SkyTrain station. As this new urban centre grows and even more options arrive, Crown will prove to be the right address for today and years to come.